What is HubSpot and why should you be using it? HubSpot is a suite of integrated software tools which brings all of the online activities of inbound marketing into one unified software product. You save time and money when using HubSpot, and all your marketing data is readily available for easy reporting to your management. 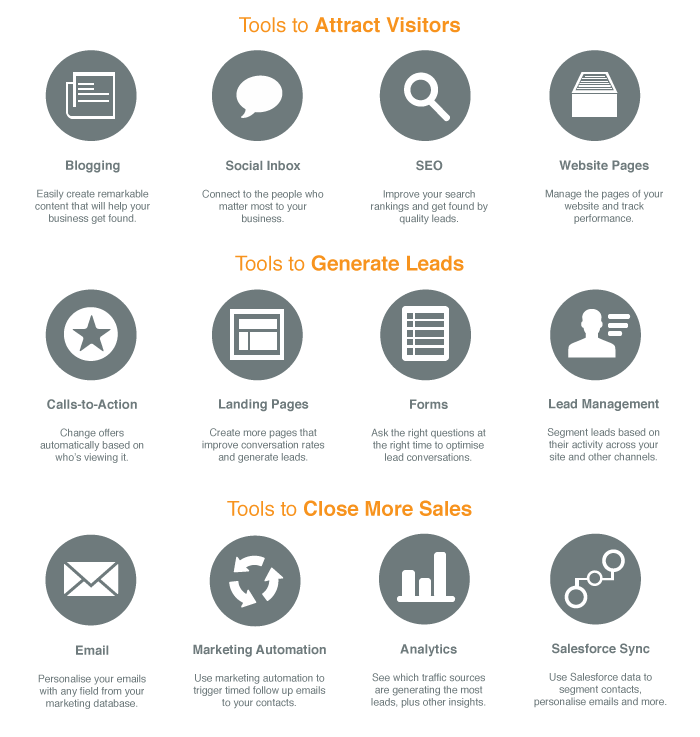 HubSpot's software contains everything you need to do inbound marketing. You can blog, send email, monitor social media, create web and landing pages, do marketing automation, SEO and more—all in one integrated platform. The diagram below gives a summary of the main tools and how they fit in with the three key phases of inbound marketing: Attract Visitors - Generate Leads - Close More Sales. HubSpot makes your marketing days easier and more effective. You no longer need to log in and out of different systems throughout the day to get your work done. Because everything is in the one place, you always know how your marketing is performing and how each piece of your marketing strategy is contributing to your overall marketing performance? Our staff collectively have the following HubSpot certifications and each staff member has at least one these. All of our staff are training regularly to maintain and improve their knowledge of the latest inbound marketing techniques and the advances in the HubSpot software. This means we know inbound marketing and HubSpot inside and out so we can provide you with the highest quality of service. 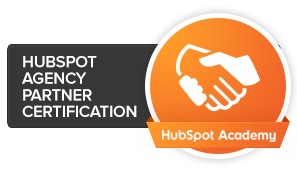 Certified HubSpot Partners are deemed fully capable of delivering marketing services using the HubSpot platform. They have also demonstrated the ability to effectively execute and manage inbound campaigns on behalf of HubSpot clients. HubSpot COS Partners are certified to deliver entire website design and development projects using the HubSpot COS website platform. 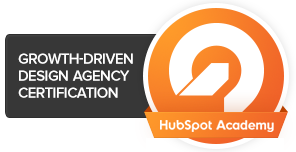 More Business Online was the first agency in Australia to become a HubSpot COS Design Partner. Growth Driven Design Agency Partners deliver peak performing websites by using the Growth Driven Design methodology. They use this smarter approach to launch new websites sooner and then use a continuous improvement program to produce the best possible results from each website. Inbound Certified personnel are highly skilled and fully capable of applying inbound marketing methodology to a business. Qualified individuals are capable of applying industry best practices to attract strangers, to convert visitors, to close leads, and to delight customers. 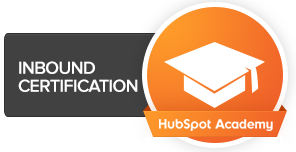 HubSpot Certified personnel are skilled in Inbound Methodology and basic HubSpot software use. They have also demonstrated a mastery of the real-world application of inbound theory and practice using the HubSpot software. 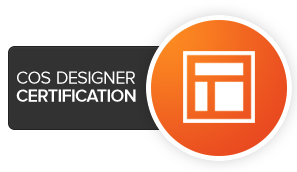 COS Certified Designers are proficient in crafting responsive, styled templates using HubSpot's Content Optimisation System (COS). They continue to demonstrate that they can effectively apply template and style knowledge to HubSpot blog, page, landing page, and email templates.